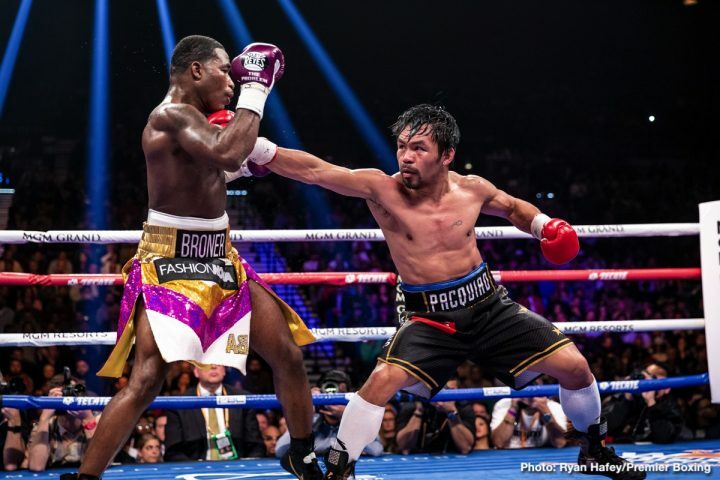 By Mike Smith: Manny Pacquiao’s dominating performance over Adrien Broner last Saturday left the Filipino star with a scratched left cornea, but not a detached retina like some had feared. The former eight division world champion Pacquiao is now is wearing a patch over the injured left eye, according to RingTV. There was initially concerns that the 40-year-old Pacquiao (61-7-2, 39 KOs) had suffered a detached retina in his left eye after getting hit with a hard jab from Broner (33-4-1, 24 KOs) during their contest last Saturday night on January 19 on SHOWTIME PPV at the MGM Grand in Las Vegas, Nevada. Fortunately for Pacquiao, the eye injury is a scratched left cornea and not a detached retina. Pacquiao is using antibiotic ointment on his scratched left eye to help it heal, according to RingTV. At the post-fight press conference, it was obvious that Pacquiao had an eye injury, as he was wiping at his injured left eye and bending forward with a look of pain on his face. Pacquiao was later forced to end the news conference early. He was also sick with a bad cold, which had bravely fought with for the entire fight. Dealing with a cold and an injured left eye, Pacquiao was still able to deal former four division world champion Broner his fourth career defeat. Pacquiao is said to have complained of vision loss and pain in his left eye in the morning after the fight with Broner. However, it appeared that Pacquiao was suffering eye pain in his left during the post-fight press conference. Pacquiao will be having a second eye exam in Los Angeles before he returns home to the Philippines. With Pacquiao’s eye injury not considered serious like originally feared, he’s going to be looking to setup a rematch with Floyd Mayweather Jr. for his next fight. The two ran into each other at a basketball game last night. Pacquiao wants the rematch with Mayweather to give the boxing world the fight that they want to see. It’s been four years since Pacquiao fought Mayweather in the ‘Fight of the Century’ on May 2, 2015, and the fans want to see the two of them square off for a second time. Mayweather carried the day in that fight in winning a 12 round unanimous decision, but that was against an injured Pacquiao, who unknowingly at the time was nursing an injured right shoulder. Pacquiao bravely fought Mayweather with one good arm and still gave him all he could handle. Mayweather attended Pacquiao’s fight last Saturday night to watch him battle the 29-year-old Broner. It was expected after the fight that Mayweather would announce the he’s facing Pacquiao next, but he instead appeared to feign indifference by not showing emotion and letting the media and fans know that he wants the fight. Aside from a rematch with Saul Canelo Alvarez, it’s the biggest fight out there for Mayweather as far as him facing a boxer. Mayweather showed no emotion at the end of Pacquiao’s fight with Broner. There was no smiles from Mayweather, and it was unclear whether he was happy or sad at watching Pacquiao defeat Broner, who had clearly patterned his fighting style after Floyd. Mayweather’s fighting style proved to be ineffective for Broner against Pacquiao. That fighting style only works for Mayweather. It’s not going to be easy for Pacquiao, 40, to get Mayweather to agree to a rematch with him. It took six years for Pacquiao to get Mayweather to finally agree to face him the first time in 2015. It’s going to take heavy lifting on Pacquiao’s part to get Mayweather to agree to fight him a second time. It’s likely going to require that Pacquiao accidentally bump into Mayweather a lot more times during basketball matches before he finally agrees to face him in a rematch. That’s how the two setup their previous fight. Pacquiao and Mayweather met up during a Clippers basketball game in 2015, and they agreed to face each other. Without the promoters getting in between, Mayweather and Pacquiao were able to agree to a fight. It was an old school way of setting up the fight, and it worked. Mayweather didn’t bother to stick around for the Pacquiao-Broner post-fight news conference after the fight. Instead, Mayweather Promotions CEO Leonard Ellerbe attended the the conference, and told the media that there won’t be a rematch between the 42-year-old Mayweather and Pacquiao. Mayweather recently fought a small 118 pound Japanese kick-boxer Tenshin Nasukawa an exhibition match on December 31 in Japan. Mayweather flattened the 22-year-old Tenshin in first round knockout. Ellerbe didn’t say whether Mayweather will continue to only fight MMA fighters in boxing events or if he’s going to stay retired. Mayweather fought UFC Conor McGregor in a professional boxing match in August 2017. The fight was sanctioned by the Nevada State Athletic Commission as counting as a professional fight. Before that fight, McGregor had never fought a professional boxing match in his life. The Nevada Commission still sanctioned the Mayweather-McGegor fight. It’ll look bad on Mayweather’s part if he continues to face MMA fighters inside the squared circle rather than Pacquiao. You can’t fault Mayweather for capitalizing on his popularity by using his fame to fighter other athletes from other sports in boxing events, but it wears thin after a while. The fans want to see Mayweather fight someone from his own sport rather than continuing to beat up on guys with no experience in boxing. Pacquiao fought like a young 30-year-old last Saturday night in giving Broner a boxing lesson in winning a wide 12 round unanimous decision by the scores 117-111, 116-112 and 116-112 at the MGM Grand in Las Vegas, Nevada. This was the first title defense for Pacquiao of his WBA World welterweight belt that he’d won last Summer in beating Lucas Matthysse. Showing top level defensive skills, Pacquiao limited Broner to just 50 landed punching during the course of their fight. The highest number of punches that Broner landed in a round was a meager seven, which is well below his average. It’s not that Broner wasn’t trying to land shots. It was the movement of Pacquiao, and his ability to duck and block shots from Broner that limited the former four division world champion to 50 punch connects in the entire 12 round fight.